Just today, Oppo launched Oppo F3 at an event in Mumbai India and we have now some information about another device from the company that may be launched soon in China i.e. Oppo R11. Oppo R11 is already appeared on Chinese 3C certification portal in China and is rumoured to come with a dual camera setup at the back. An alleged image of Oppo R11 had leaked some time back showing the dual camera setup at back, aligned horizontally at the top left corner. 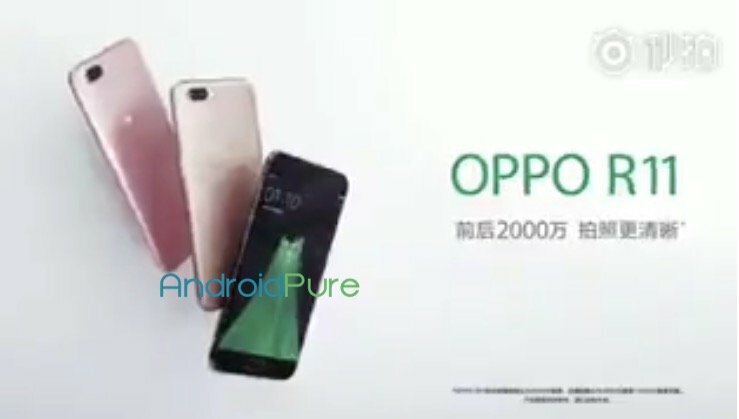 Today an alleged TV commercial of the upcoming Oppo R11 has leaked on the web which confirms the earlier leaked image and shows the dual camera setup at the back as suggested earlier. The TV commercial also suggests that Oppo R11 comes with a 20 MP front shooter for selfies apart from the dual camera setup. The TV commercial does not reveal any other technical specifications such as display size, Battery capacity or the Processor. Update: The Youtube Video is taken down. An earlier alleged listing on GFXBench suggests that Oppo R11 features a 5.5-inch full HD 1080p display and comes with 16 MP + 16 MP camera sensors for the dual camera module at back. As the TV commercial suggests, gfxbench also indicate a 20 MP front shooter for selfies. It features 4GB of RAM and 64GB of storage running Android 7.1.1 Nougat.